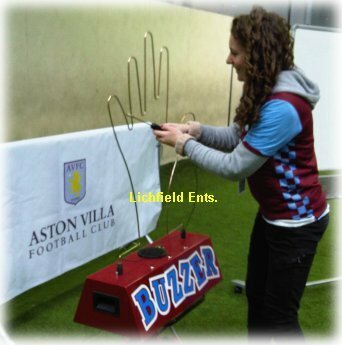 Hire our Giant Buzzwire game and the test how steady your hand is! A mains powered automated game where each participant gets sixty seconds and three lives to complete the game. Each time the wire is touched the buzzer sounds and one of the three 'life' lights goes out. As you're playing the machine produces a heartbeat sound which quickens as the time runs down. We also have a more basic 'buzz sound only' version which runs from a rechargable power pack so is ideal for events where there's no mains electric available. If one of our Giant Buzzwires isn't big enough then the answer is our new Mega Buzzwire which is 10ft long! This huge buzzwire is powered by a rechargable power pack so mains electric isn't required. 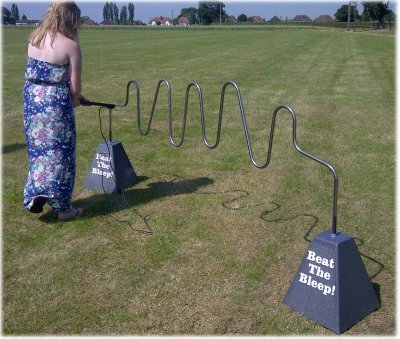 A giant or mega buzzwire game is a great amusement for fetes, parties, fun days, and is also a great attraction for promotional events and exhibition stands. If you have any queries, questions, or would like to book a Giant Buzzwire game for your event please call us on the number below or click to enquire and we will do all we can to help.